Plastic films are used extensively for silo bags, bunker covers, bale wraps, and horticultural mulch. 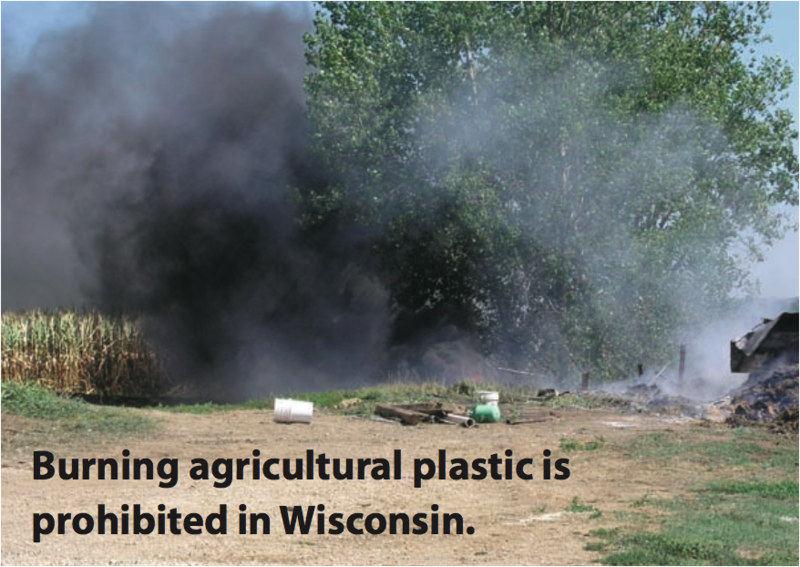 Managing large, dirty plastic sheets is a major headache and cost for Wisconsin farmers. Until recently, the only legal disposal option for most farmers was landfilling. These plastic films, once largely unusable resources, can now be recycled into other plastic products. 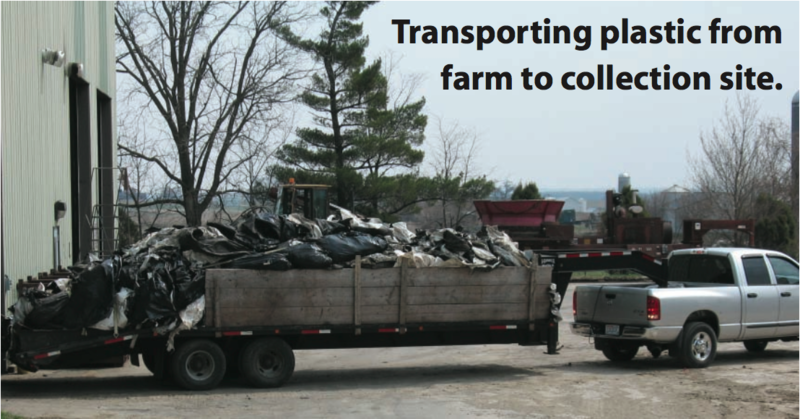 Some communities are exploring ways to create local collection and/or baling sites, commonly located at landfills and solid waste transfer stations. In a few cases, plastic processors offer on-farm pickup services to facilitate easier recycling. Some processors or counties may require plastic to be managed in certain ways and delivered at certain times of the year. To determine the available options and relevant requirements in your area, contact your UW-Extension, Land Conservation Department, or SolidWaste/Recycling Department offices. 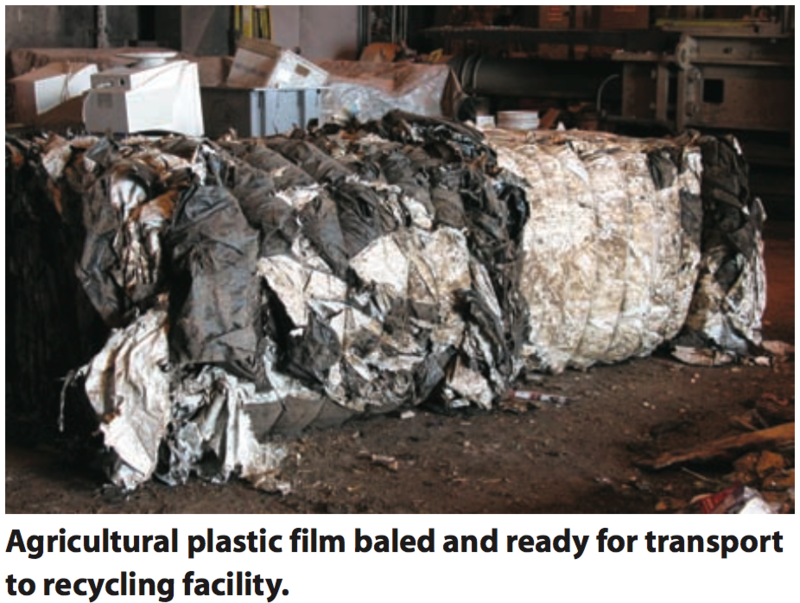 This publication reviews practices farmers can use to efficiently manage used plastic films. The general goal of such practices is to keep plastic as clean and dry as possible to maximize recycling opportunities. Minimize plastic waste. 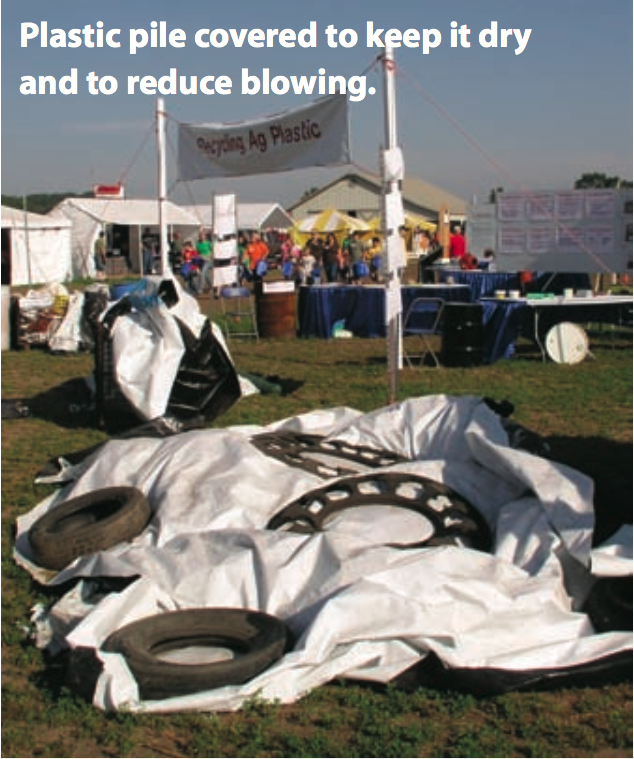 Reduce waste by purchasing the right size silo bag or silage cover for your needs. Minimize plastic contamination. Locating silo bags on concrete or asphalt pads keeps bags clean, allowing entire bag – top and bottom – to be easily recycled. A gravel base is less expensive, but grit and debris can adhere to the plastic. Soil bases lead to the greatest contamination of plastic. If bags must be placed on soil, use higher elevation sites with good drainage. Avoid removing silage when soils are wet. If the plastic is dirty, let it dry and then shake it with a bucket loader to remove soil and make it more suitable for recycling. Remove the plastic film from silos frequently. Removing less than three days’ accumulation of top silage film at a time maximizes silage protection and keeps the size of plastic sheets small enough to be easily handled. Cut the plastic to keep it manageable. 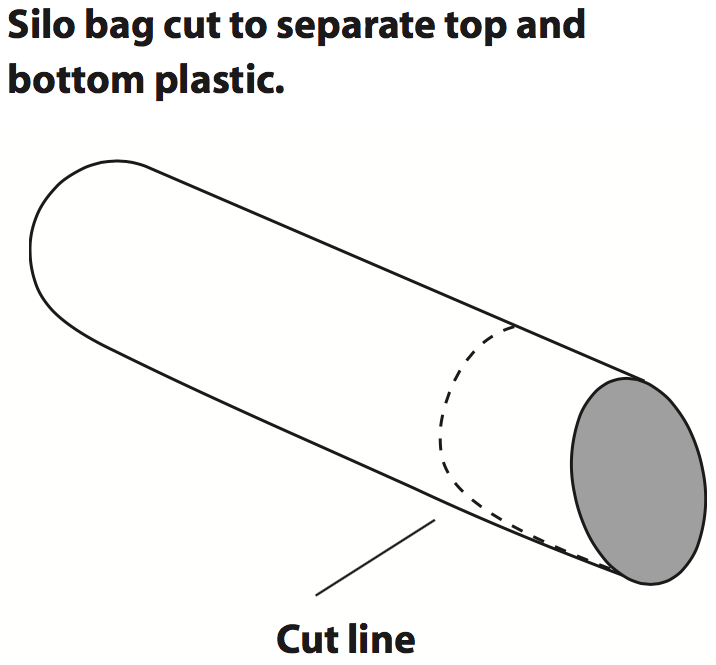 For silo bags located on soil, separate the top plastic from the bottom plastic by cutting the plastic from the top down to four inches above ground (see illustration). Slice the bottom plastic at 10- or 15-foot intervals for greater manageability. Keep stored plastic dry and secure it to minimize blowing. Shake dirty plastic to remove soil and debris. Then bundle it by rolling it or tying it with a strip of sheet plastic or plastic baler twine. (Do not use non-plastic twine.) Or, place unbundled plastic loose in a storage area. While placing plastic on the ground is common, it requires extra labor later to load the pile for hauling. A hayrack or trailer can provide convenient storage and eliminate re-handling. If the pile is stored outside, cover it with a weighted top sheet to keep it dry and protect it from blowing. A number of low-cost plastic containment pens can be constructed using plastic fencing, hog or beef panels, or pallet bins. Transport the plastic to a collection center. 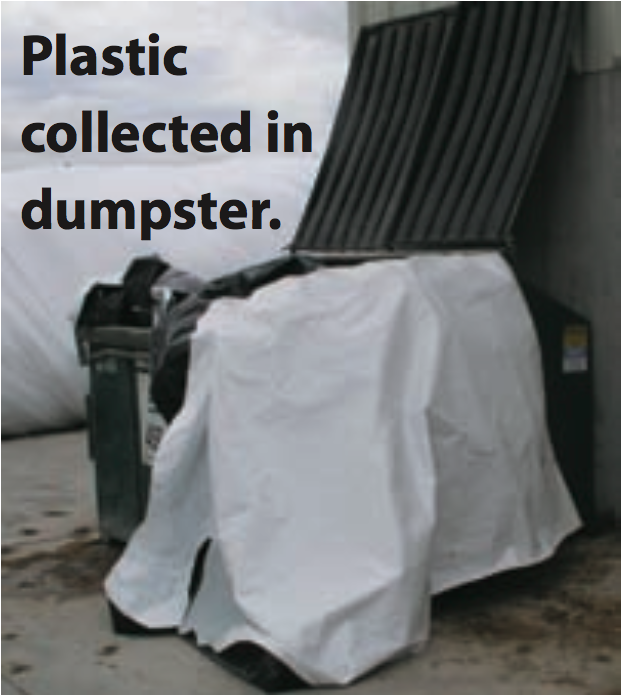 Use a dumpster, roll-off box, farm truck, or wagon to haul the plastic to the recycling collection center. Secure the plastic to prevent blowing. Large vehicles with densely-packed plastic provide the most efficient transportation. Copyright © 2009 by the Board of Regents of the University of Wisconsin System doing business as the division of Cooperative Extension of the University of Wisconsin-Extension. All rights reserved. Send copyright inquiries to: Cooperative Extension Publishing, 432 N. Lake St., Rm. 231, Madison, WI 53706. Agricultural and Life Sciences at the University of Wisconsin-Madison and a specialist with the University of Wisconsin-Extension, Cooperative Extension. Roger Springman is the manager of the Wisconsin Clean Sweep Program with the Department of Agriculture, Trade and Consumer Protection. Thank you to Wood Residuals Solutions, LLC, for partial funding of this publication. Produced by Cooperative Extension Publishing, University of Wisconsin-Extension. Cooperative Extension publications are subject to peer review. Issued in furtherance of Cooperative Extension work, Acts of Congress of May 8 and June 30, 1914, in cooperation with the U.S. Department of Agriculture, University of Wisconsin-Extension, Cooperative Extension. University of Wisconsin-Extension provides equal opportunities in employment and programming, including Title IX and ADA requirements. If you need this information in an alternative format, contact the Office of Equal Opportunity and Diversity Programs or call Extension Publishing at 608-262-2655.To see more publications or to order copies of this publication, visit us at learningstore.uwex.edu or call toll free: 877-WIS-PUBS (877-947-7827).